Promote special events like carnivals, tournaments, rallies, sports events and conventions, etc. Increase public support and interest for your favourite team, candidate, political party, public figure, cause, special event, charitable organisation, etc. 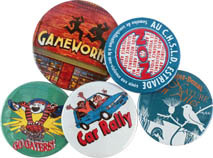 Encourage team spirit in a school, summer camp, special event, political convention, etc. Raise funds by selling your cello button to the public. Identify key people at a special function, rally, convention, event, etc. It's easy…all we need is a sample design of what you want on your cello button and the diameter size of the cello button you want made. Contact us now for a quote.